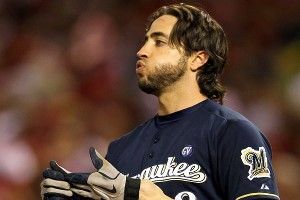 Ryan Braun will be in the Milwaukee Brewers lineup on Opening Day. On Thursday, an arbitration panel upheld Braun’s appeal and threw out a pending 50-game suspension against the reigning National League MVP. It marked the first time that a major league player has ever had a positive drug test overturned. When news about the positive test first broke, a source close to Braun vehemently contested the charges. In a text message to the Milwaukee Journal-Sentinel, Braun wrote: “I am completely innocent. This is B.S.” Of course, many players before him had insisted in their innocence, too. When Braun’s results were leaked, the details of that test, and even the suspected effects of performance-enhancing drugs, were anything but definitive. Given how little we knew at the time, it made no sense to rush to judgment. What Braun’s successful appeal means for MLB’s efforts to monitor and curtail PED use is open for debate. Probably nothing, other than make sure to use a collector who follows the rules. Braun reportedly successfully argued that his sample was not properly shipped for testing, and that mistake meant the results should be thrown out. What we do know is that the 2012 Brewers’ chances look better now than they were a couple hours ago. This was already a strong team even without Prince Fielder and with Braun potentially sitting out 50 games, thanks to a strong pitching staff and a defense that stood to improve with Alex Gonzalez replacing Yuniesky Betancourt at shortstop. With Milwaukee’s star player now exonerated, things can only get better.